Promote your company in a flash and with some inspired style with our Company Branded Torino Laptop Bag. Lightweight and easy to fit most laptops including Toshiba, Dell, Samsung, Sony Vaio, Apple MacBook and more. Quick and secure, lockable with padlockable zipper, you can carry the laptop or netbook charger in the front pouch, alongside your spare usb mouse, pens and dvd-roms and other software. The netbook or laptop will be safe with the cushioned padding inside, without worry of breakage, bumps or shocks. A document slot inside allows safe storage of software or hardware manuals and other documents. the uses or laptop bags. Everybody uses laptops! 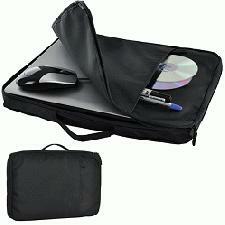 so lets have Everybody use your promotional laptop bag! Fitted with a easy-to carry handle for comfort.